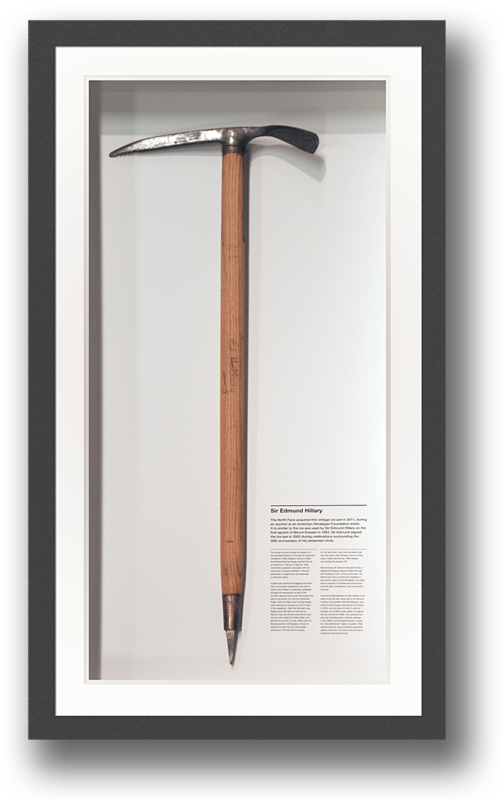 This Ice Axe, signed by Sir Edmund Hillary, is part of a corporate collection of several ice axes framed for RAPT Studio for their design project at VF Outdoor's new Alameda, California, campus. The length, depth and weight of the axe, coupled with its value, posed unusual technical framing challenges. In addition, the client needed a description of the axe printed on the background to which the axe was attached. We solved these challenges by using a black wood frame with an internal depth of 4.5" with mat walls and an 8 ply mating to create the 'encased' look. We printed the text on Epson Enhanced Matt paper mounted to four ply rag board. The rag board was then mounted to acid-free coroplast which was then attached to a wooden strainer for support. Each axe was attached with plastic coated wire, colored to match the shaft.